With my Writer’s of The Future win, I’ll be going to Los Angeles in a few months and there’s no telling who I may meet at the workshop. It’s therefore a logical time to order the new business cards I’ve been putting off. But what is a business card in this day and age? When I meet someone new, it still makes sense to hand them a card with my contact information and a little space to jot a note. Sure, why not? But no one is going to file that card away like in days of yore–I certainly wouldn’t. And no one needs the info bloat that has become common today, what with websites and screen names and sometimes icons jockeying for real estate. No, I only need the card to do a couple of things, but I need those things done well–and one of them is giving my new found acquaintance machine readable contact information. What then, are my new design requirements for my new business card? To list basic contact information, phone, address, email, and linked-in profile. To contain a vCard, encoded as a QR code for easy smart phone scanning. To highlight my web presence and brand. To be free of clutter and professional in tone. To have a sleek design by a professional graphic artist. To be free of the cost of a professional graphic artist. Okay, so my first stop was to visit www.qrcode-monkey.com and create my quick response codes. 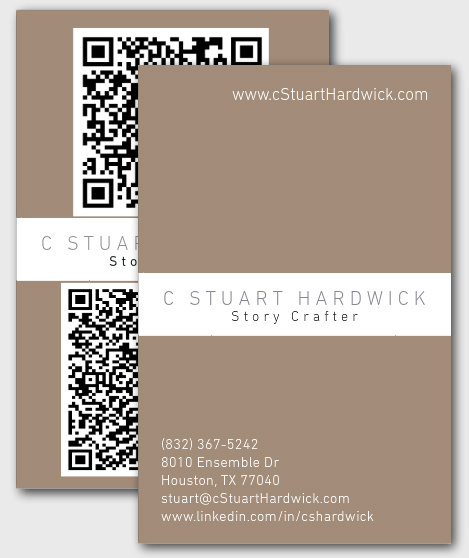 I created one encoding my basic contact info as a VCard and another encoding the URL to a landing page under my top level website, www.cStuartHardwick.com. It’s important to put as little data as possible in a QR code because the more data you cram in, the smaller the picture elements and the harder it is to decode. We do NOT want our new business contacts futzing around with balky QR codes! So the VCard is minimal, and the link is to a landing page that may contain more information along with anything that changes or that I decide to add later. Next stop was Moo, a well-regarded printer with a robust online card designer featuring lots of stock, graphic artist-designed templates to choose from. After sorting through this for a few interminable forevers, I found a design I liked. It did not allow me to put the QR codes where I originally planned, but it did allow me to upload a graphic for the back of the card. So with a little editing in Pixlr, that was easily sorted. The final design, I think, is spot on. It’s clean. It’s clear. It highlights brand and essential contact info. On the reverse, the QR code for the landing page has a little icon to make clear that it’s a website (such icons are a free feature of QR Monkey, but y themake the code more complex so I elected not to add one to the vCard). So that’s that. And now, I think, it’s off to work I go.